Lock in a great price for Hotel Capitán Eberhard - rated 8.2 by recent guests. Brilliant views across the Sea and the mountains. 5 mins walk to laundrette, restaurants etc. 10 mins to town centre. About 20 mins walk to bus station. Helpful staff. THE HOTEL IS RELYING ON ITS LOCATION OVER LOOKING THE FJORD. THE ROOM WAS SPACIOUS CLEAN AND HAD A GOOD BATHROOM.BREAKFAST WAS FINE AS LONG AS YOU ASKED FOR THE EGGS WHICH DID NOT APPEAR WITHOUT A PROMPT. Very atmospheric hotel with unbeatable views (at least from my window). The bed was unbelievably comfortable; I wish I could take it home. Excellent hot and powerful shower. Very kind staff, although not all are comfortable with English. Mi habitación estaba muy buena. La de nuestros amigos, llovía sobre el lavabo cuando se bañaban en el piso superior. Esta bien ubicado, es un hotel acogedor es viejo pero es bonito y limpio. El personal siempre fue muy amable conmigo. La ambientación del hotel y la vista de la habitación. La atencion de los encargados y la esplendida vista al mar. La ubicación es excelente y tiene una vista preciosa desde el living. 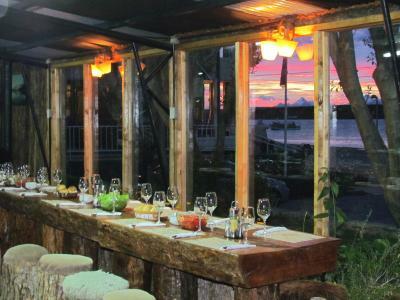 Offering an onsite restaurant, free breakfast and free Wi-Fi, Hotel Capitán Eberhard is located in Puerto Natales. The hotel sits in front of the sea and the promenade is only 10 yards away. Rooms here have lots of colour, striped fabrics and pictures on the walls. Each comes with a private bathroom, cable TV and heating. At Hotel Capitán Eberhard guests can count on 24-hour front desk assistance. Guests can find Navimag Pier and a tourist information booth only 200 yards from the hotel, a 10-minute walk away. Both Puerto Natales Museum and the main square are 450 yards away. Hotel Capitán Eberhard offers free private parking, without reservation. This is our guests' favourite part of Puerto Natales, according to independent reviews. 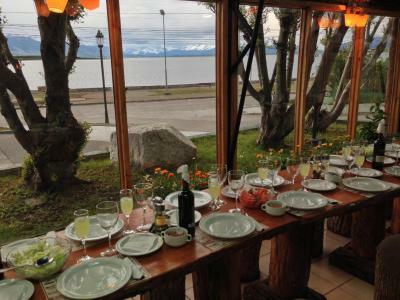 This property also has one of the best-rated locations in Puerto Natales! Guests are happier about it compared to other properties in the area. Hotel Capitán Eberhard has been welcoming Booking.com guests since 13 Dec 2013. When would you like to stay at Hotel Capitán Eberhard? This room features a private bathroom, cable TV and heating. This room comes with a private bathroom, cable TV and heating. House rules Hotel Capitán Eberhard takes special requests - add in the next step! Hotel Capitán Eberhard accepts these cards and reserves the right to temporarily hold an amount prior to arrival. The shower Was dirty. Old hairs in the shower tube. The accommodation is a little tired. Noise from above. The carpets felt damp in our room. Position, good coffee and breakfast good shower. The staff was extremely helpful and went above and beyond for us. the property to old and the floor make a lot , a lot noise. It is an old building and sound travelled easily. Each morning (two) I was woken up at 5 am by the footsteps of the people above me who were probably going on tours. Also, the traffic sound was a tad annoying. The breakfast had some options for vegans, but this could be improved, for example by offering bananas and something more nutritious than factory-made jam. It was good to have kiwis, though. There was confusion about the payment, as my information from Booking suggested that half of the payment had already been taken from my bank account when I made the reservation, half a year ago. Yet this was not reflected in the hotel's records; apparently, the hotel has no such practice. The confusing situation was resolved amicably and in my favour, with utmost respect by staff. I do not know what caused this problem. Simple and clean hotel by International standards. slow internet speed and bathroom hot water didn’t run consistently. THERE WAS ONLY 1 MEMBER OF STAFF WHO COULD SPEAK SOME ENGLISH BUT WAS VERY HELPFUL. THE OVERALL IMPRESSION I GAINED WAS THAT ITS DAILY OPERATION WAS SOMEWHAT CHAOTIC. ROOMS VARIED IN SIZE QUITE DRAMATICALLY.THE HEATING WAS AIRDUCTED WITH NO SEPARATE CONTROL IN THE BEDROOM RESULTING IN THE ROOM BECOMING INCREDIBLY TOO HOT DESPITE OPENING THE WINDOWS.